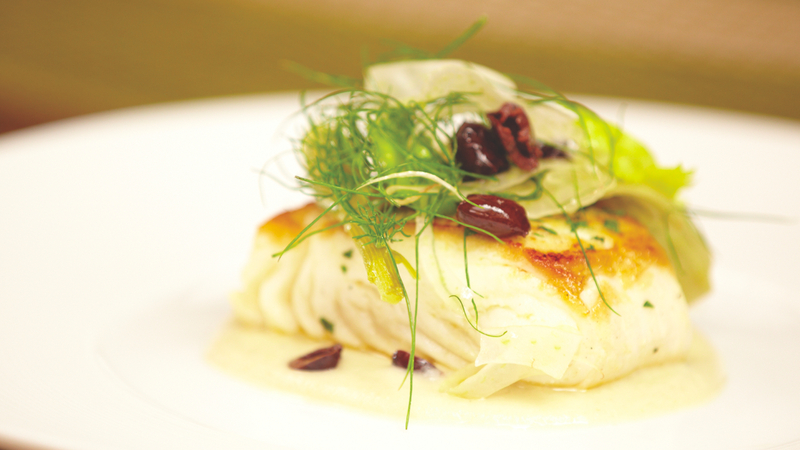 Pacific halibut is a firm, dense and sweet white fish that requires little seasoning to enhance its fresh flavor. Whether grilled, roasted or slow-cooked in a stew, lean halibut is a fish with loads of nutritional value and versatility. Our healthy halibut recipes are a fresh, flavorful and healthy alternative to chicken recipes or steak recipes—and just as filling and satisfying for your entire family. Prepare barbecue (medium-high heat) or preheat broiler. Season halibut steaks with salt and pepper. Brush fish with 1 tablespoon vinaigrette, dividing equally. Grill or broil halibut steaks until just cooked through, about 4 minutes per side. Transfer fish to plates. Rewhisk remaining vinaigrette; pour over fish. Garnish fish with remaining 1 tablespoon basil and serve. Per serving: calories, 224: fat, 10 g; cholesterol, 45 mg; sodium, 125 mg.